In Ulricehamn, Sweden, Marbäck Tricot has been knitting fabric since the 60s. It is in a region where the Swedish textile industry used to be booming. Today not a lot of factories are still in use. My sister and I want to visit as many active factories as possible to see if it is possible to make the fabric we want in Sweden. The CEO Jonas Lorentzon and his colleague Carina Abrahamsson greets us as we arrive. The factory now has 10 employees in Sweden and about 140 in Latvia where they also offer sewing. After showing us samples of what they can knit, we walk into the machine area. Many big round knitting machines are in use, and they can knit both single jersey and rib. 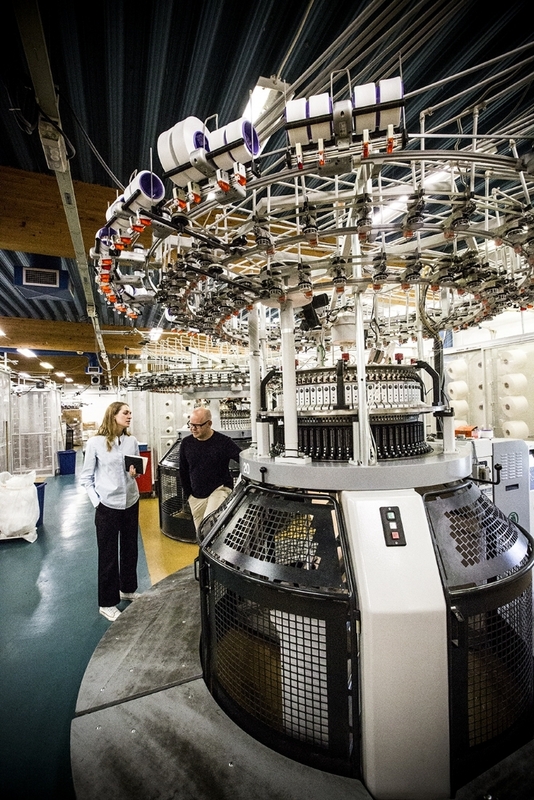 At Marbäck they can knit many different qualities of fabrics, but the yarn needs to be very thin for their machines. NM34 single thread is the thickest yarn they can use for a single jersey. For rib quality NM40/1 is the thickest possible. They can knit 100% wool fabrics but they have never tried knitting a wool fabric without TEC-treatment (Total Easy Care—also called Superwash). Most wool jersey has this treatment to make the garments machine washable in 30 degrees or more. Total Easy Care is a chemical treatment where the wool fibers are put into an acid bath to remove the natural scales on the fiber. The wool fiber then gets a synthetic oil-based polymer coating which stays on the wool so it will not get felted when washed. There is no law that requires to write this on the material description of the garment. All wool garments that are machine-washable over 30 degrees have this treatment. I do not want my garments to have this treatment since this is a chemical treatment with an oil-based material. Wool has very positive characteristics, it is naturally antibacterial and the fibres do not soak up dirt, unlike other natural materials. Wool garments should not, and do not need to be washed too warm or too frequently. It is better to hang them out to air them, or to simply brush off dirt. Wool can be used in both cold and warm weather as it can isolate heat as well as keep moisture away. After Marbäck has knitted a fabric it needs to be washed before sewing. We discuss different alternatives for washing since the wool fabric I want cannot be washed in high temperatures. We also discuss different quality of sewing thread to use. Our visit at Marbäck Tricot factory gives me many ideas but also many more things to investigate. The CEO Mr. Lorentzen invites us back to try out our quality once we have a finished yarn in the correct size.